Do you need to get that special cruiser in your life a gift? Whether it is the upcoming Christmas holiday or another special occasion, don’t worry about finding the perfect present. 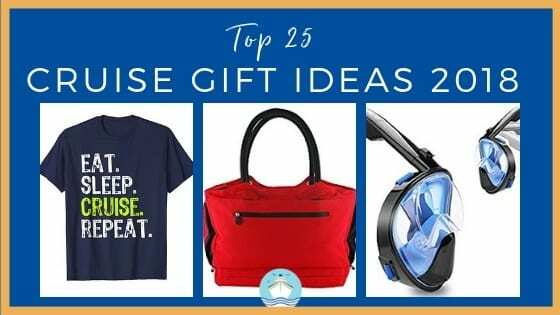 We have put together our Top 25 Cruise Gift Ideas for 2018. We have gifts in all price ranges. 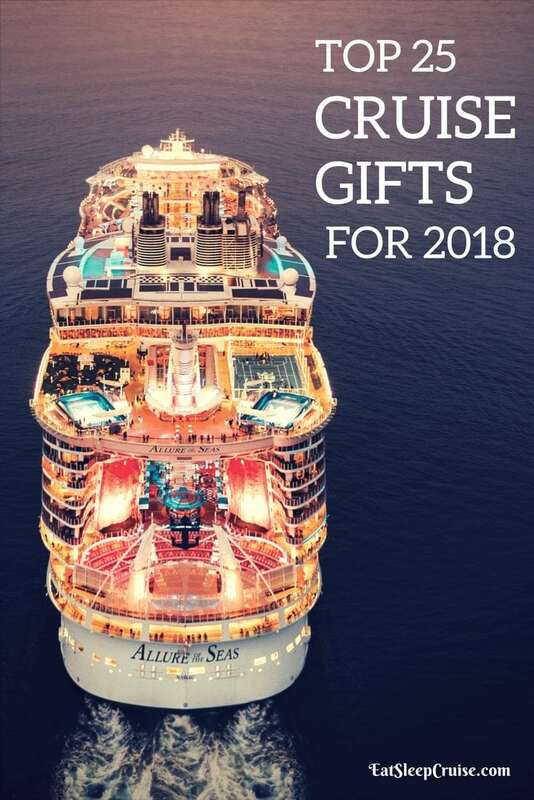 So, whether you want to get a little something or go all out, the perfect cruise gifts are here. Reusable Straws – With cruise lines essentially eliminating plastic straws, we had to find a way to enjoy our frozen drinks. These eco-friendly and packable stainless steel straws are a perfect fit in a beach bag. The set comes with a carry case and a cleaning brush, and is just what every cruiser needs for the pool deck. Cruise T-Shirts – Show the world your love for the ocean with a fun cruise t-shirt. Yes, we are partial to certain sayings and graphics, but there are plenty to choose from. They are perfect for mom, dad, the kids, and even the grandparents. Everyone will love to wear one of these t-shirts on their next cruise vacation. 180 Degree Snorkel Mask – Ocean lovers are going to want to upgrade to a modern snorkel mask. Topping my list this year is the Seaview snorkel mask. This modern design gives you unparalleled views of the ocean. Complete with an attachment for your Go Pro and a tubeless design, you will wonder why you hadn’t upgraded sooner. Mobile Power Charger – Power outlets are a premium in a cruise cabin. That is why this conveniently shaped and cruise friendly charging station tops our list of the best cruise gift ideas for 2018. Charge your phone, cameras, and up to six devices with a mix of USB ports and traditional outlets. The extension cord allows you to strategically place the device to maximum space. Noise-Canceling Headphones – If you want to escape to your own little paradise while on a mega-ship, these Beats Studio 3 headphones will do the trick. These wireless headphones deliver unparalleled sound quality. In addition, the headphones can block out all of the surrounding chatter to allow you to enjoy your favorite songs, audiobooks, or other streaming from your smart device. Mirrorless Camera – We upgraded our digital camera experience last year, and there is no looking back. While there are a few good options on the market, we have had great luck with the Sony Alpha mirrorless camera. This compact camera delivers amazing photos, 4K video, and provides some of the easiest to use controls and intelligent auto settings making any photographer a pro. Anti-Theft Beach Bag – Never worry about leaving your bag unattended again. The CoolBag Generation 2 will keep your personals safe with a combination lock zipper and cable handles that can be secured to a lounge chair while you are enjoying yourself at the pool or beach. Or, if the cruiser in your life is setting off to a cold weather destination, one of these classic Travel On Messenger Bags is a great choice. Travel ashore with ease and security with this stylish bag which features RFID protection. The bags offer plenty of pockets for your tablet computers, cell phones, and other items. Yeti Water Bottles – Staying hydrated while onboard or exploring a port of call is crucial. That is why we invested in an oversized Yeti Rambler bottle to fill with water. It really does keep things cold for the entire day. You might even consider a pair of Yeti tumblers with lids for those frozen drinks or iced coffee. After all, no one likes a watered-down drink! These Yeti thermoses also work great at keeping coffee warm if you are thinking of cruising to a colder locale. RFID Passport Holder – You need to protect yourself when traveling. This new RFID passport holder is not only fashionable, but it also blocks cybercriminals from stealing your information. With plenty of room for your key card, some cash, and credit cards, this can serve multiple purposes during a trip. Cruise Lanyard – Would it be a cruise if you didn’t have your key card easily accessible? It is a time-honored tradition to proudly wear your lanyards while roaming the open air decks. Now, you have your key card at your fingertips to swipe for your next cruise drink. Cruise Luggage Tag Holders – Don’t waste time folding and stapling your cruise tags to your luggage. These holders make adding your cruise tags to your suitcases simple and painless. These tag holders are perfect for Carnival Cruise Line, Princess Cruises, and Norwegian Cruise Line. These luggage tag holders work for Royal Caribbean and Celebrity Cruises’ passengers. Either way, these are the perfect little gift. Lounge Chair Towel Clips – Don’t let the wind stop you from enjoying the Caribbean sun. These decorative towel clips fasten to any lounge chair in a snap. Find the pair that matches the personality of that cruiser in your life. From animal designs to flip-flops, why not grab a couple for all your family members? These inexpensive gifts fit easily into your carry-on and are a must for any cruiser. Fitness Tracker (or Smart Watch) – Keep track of your steps, decks climbed, and overall activity with the Fitbit Charge 3. This tracker will also record your heart rate as well as calories burned during the day. Interchangeable bands also mean that you can customize the tracker to match your outfit. Or, you can upgrade to a brand new Apple Watch if you want to go all out. Luggage – If you travel often, you probably go through luggage every few years. If it is time to upgrade your baggage, consider the TravelPro Crew 11 series. This lightweight and durable polycarbonate suitcase comes equipped with built-in RSA approved locks. In addition, the luggage offers separate compartments for organized packing. The adjustable grip handle and “no drift” 360-degree spinner wheels make it worth the additional costs. Cell Phone Case – The days of disconnecting while at sea are long gone. Everyone takes their smartphones with them on vacation including cruisers. So, make sure your device is protected while lounging at the pool or beach. We can’t live without our Lifeproof cases for our iPhones. If you already have a case for your phone, we suggest an inexpensive waterproof travel case. Packable Luggage Scale – If you are married to an over-packer like I am, then you need a durable travel luggage scale. Never pay luggage overage charges again. Accurate and easy to use, you can quickly determine the weight of your bag with this device. Avoid frantically emptying your suitcase at the ticket counter of the airport to get it under the allowable weight limits. Magnetic Hooks – While they may not sound too practical for some travelers, cruisers will thank you when they see these handy hooks. Small yet strong, these magnetic hooks provide extra storage in those cramped quarters. Hang bags, clothes, the daily activity schedule, your tour tickets, and more; the sky is the limit. We suggest the 40 lb. magnets if you plan on hanging anything with a little weight to it. Travel Games – Frequent cruisers know to pack a few games in their carry-ons for when they want to take a break from the sun. For family-friendly fun, our new addiction is the dice game Quixx. You can also consider the dice game Left Center Right. Or, for those cruisers who aren’t “easily offended”, a few decks of Cards Against Humanity is sure to spice up your trip. Insulated Wine Carrier – If the cruise line permits you to bring two bottles of wine onboard, this nifty wine bottle carrier will ensure your beverages arrive safely. This trendy carrier is insulated to protect your wine bottles from breaking during transit. These holders are easy to carry and stow away once onboard. The neoprene material will mold itself to fit most 750ml bottles of wine regardless of the shape. Cord Organizer – If you are like us, then you might be bringing a few extra electronics along on the trip, like phones, tablets, and cameras. Keep all of your device cords organized with the ProCase Travel Organizer. Keeping everything neatly tucked into one place, this accessory makes packing a breeze and ensures that you won’t leave any essential cords behind. Water Shoes – If you are cruising to a warm location, you may be partaking in some water-related activities. We recently upgraded to a pair of versatile Sperry water shoes. With the design of a sneaker, these lightweight shoes offer great traction. However, they have built-in drains and are made from quick-dry material. Go Pro Wearable Camera – Record your entire vacation in 4K video with the world’s most popular wearable camera. The new GoPro Hero 7 is waterproof, has a digital display and menu, and can be easily secured to clothing and other attachments. Also, new in this version is enhanced stabilization. Now, you can capture zip line rides and water slide falls with smooth HD video. Don’t forget to throw in some extra memory cards as there will be a lot to document. Tablet Computer – You could pack some paperback books, crossword puzzles, a computer, a camera, and other devices to enjoy on your vacation. Or, you could put all of those items at your fingertips with a small tablet computer. You can’t go wrong with a new iPad, one of the most popular tablets available. For the little ones, you might opt for an Amazon Fire HD 8 Kids Edition Kindle which is kid-proof and still offers great content, games, and other features. Onboard Suprise – Send your favorite cruiser off in style with a special onboard delivery. If you know their next trip, you can contact the cruise company to order a special something for when they arrive. Packages often include bottles of champagne, balloons, flowers, and treats like chocolate covered strawberries. 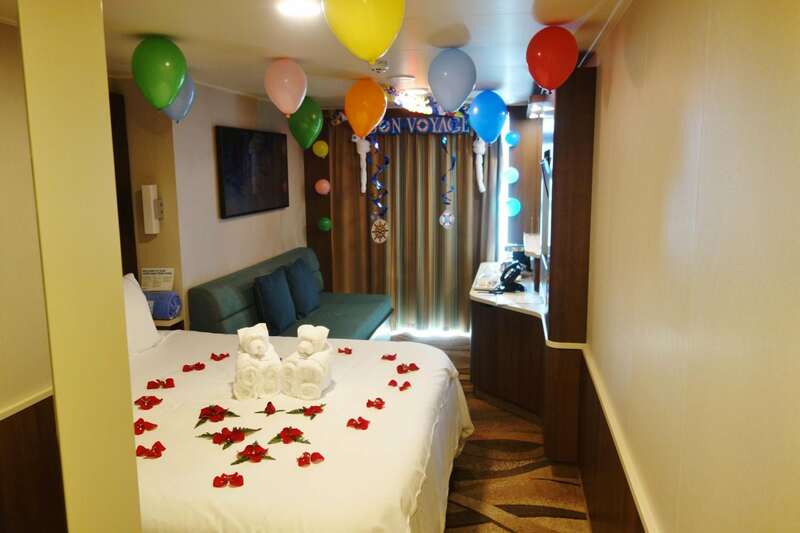 It is the perfect way for them to celebrate their sail away. 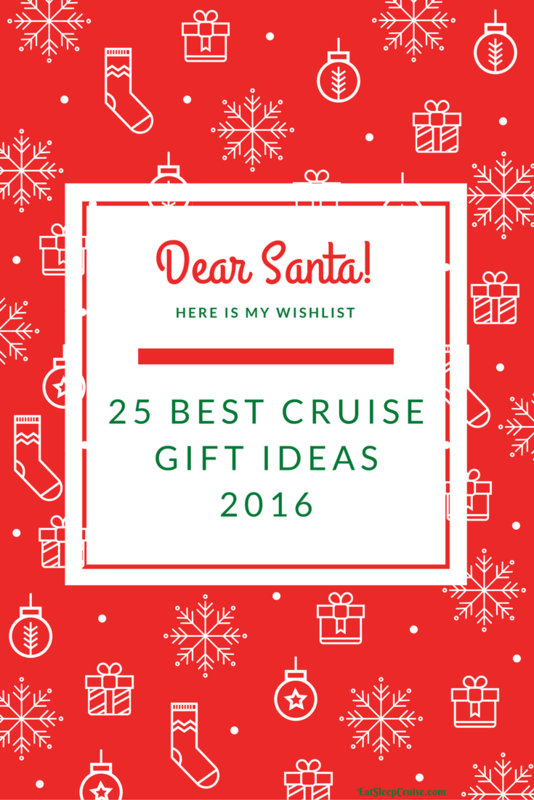 Cruise Gift Cards – Not exactly sure what to get that cruiser in life? While the Princess thinks they are a bit impersonal, I think a cruise gift card is a great gift choice. Many lines offer cards including Norwegian Cruise Line and Carnival Cruise Line. If your favorite cruise line does not offer gift cards, you can still add onboard credit to an existing account for most lines. It just takes a little more work. A Cruise – Yes, if you are willing to splurge this year, you can get that special someone the ultimate cruise gift- a cruise! Surprise him or her with a brand new trip to plan. Or, if you can’t swing a new reservation, perhaps you can upgrade that inside cabin for a balcony or go all out with a suite. If you time it right with some of the cruise deals happening now, the upgrade may not be as costly as you think. How many of these items do you take on a cruise? Have we missed one of your favorite cruise gift ideas? Drop us an anchor below to share your favorite gifts for all the cruisers in your life.